A NEW book looking at the history and heritage of the Bahamas and the Turks and Caicos Islands was released on December 9. 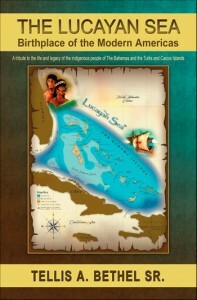 Bahamian author Tellis Bethel wrote the non-fiction work entitled ‘The Lucayan Sea: Birthplace of the modern Americas’ to unveil a hidden identity, purpose and destiny for the people of these islands. A British-trained naval officer by profession, Captain Bethel’s timely research explores the plight of the indigenous Lucayans and the impact of world-changing events that originated from the shores of the Bahama chain of islands at the dawning of the modern Americas. The peaceful Lucayans were an offshoot of an ancient migration that trekked eastward across Asia into North America, Bethel explained in his book. They were the first to settle the Bahama Islands, the first to welcome Italian explorer Christopher Columbus to the Americas in 1492, and the first to suffer total genocide at the beginning of a new era. Through this tragic episode and the historic events that followed, Captain Bethel revealed an “inherent responsibility” for the inhabitants of these islands that, if fulfilled, would foster peace, security and prosperity for generations to come. Like a maritime explorer of old, Captain Bethel took readers on a voyage to rediscover the New World of the Americas through the extraordinary heritage of the Bahama Islands and the people who inhabited them. As readers journey through the pages of this eye-opening book, they will discover an ancient quest that culminated in the Bahama chain and the birthplace of the modern Americas. In his book Bethel explains that there is a leadership role that that modern-day Bahamians and Turks and Caicos Islanders were meant to play within the Americas and the wider world. He added that there is an inherent responsibility bestowed upon today’s inhabitants of the Bahamas and the Turks and Caicos Islands, and the many visitors to their shores as a result of the Lucayan genocide. The book also talks of a life-enriching identity for the people of the Bahamas and the Turks and Caicos Islands in light of their history, geography and culture. Bethel proposed a name for the waters surrounding the Bahama chain as a lasting tribute to the Lucayan legacy, and a reminder for all to help make the world a more peaceful place. The book is now available online in hard copy and kindle at Amazon.com and Barnes and Noble. It will also soon be available at bookstores in the Bahamas and the Turks and Caicos Islands. 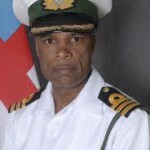 Bethel is currently serving in the Royal Bahamas Defence Force as Deputy Commander Defence Force. A graduate of the Britannia Naval College in Devon, England, Captain Bethel has a Master of Arts degree in Leading Innovation and Change from York St John University, York, England. He lives in Nassau, Bahamas with his wife, Teri, and their two sons.